Before children are able to care for their own teeth, it’s important to begin teaching them healthy oral habits. Starting when kids get that very first teeth, you can begin working with them on dental hygiene and healthy practices so they can keep their mouth and teeth healthy for a lifetime. Here’s a closer look at how you can teach healthy habits to your children at every age so they enjoy a healthy, beautiful smile. As soon as your baby is born, it’s important to begin caring for gums. Before they even have teeth, wipe their gums with a damp cloth or gauze. This cleans the gums and starts to get them used to oral care. Once that first tooth pops in, then you can begin brushing with a tiny drop of non-fluoridated toothpaste. After teeth start touching, you can gently begin flossing their teeth. Part of keeping teeth healthy and strong is keeping up with routine dental visits, and taking your child to the dentist early helps facilitate good oral health, both now and in the future. Once your child has that first tooth, make a dental appointment. This not only allows a dentist to ensure teeth are growing in properly, but it can reduce anxiety about future dental appointments. Make brushing your teeth together a morning and nighttime routine. Have a contest with your kids. See who can do the best job spitting toothpaste to the drain or who can create the most toothpaste bubbles. Floss your own teeth while kids are watching, and then work with them on flossing their own teeth. Model healthy eating habits. Limit the sugary sweets that both you and your children eat. Remember, keeping junk food out of your home is the first step. Choose teeth-friendly foods yourself, such as milk, yogurt, or nuts. Even when you’re on vacation, make sure you still model good oral habits and keep up with your dental hygiene routine. If possible, make your dental appointments at the same time as your child’s. When you show that dental care is a priority, they’ll learn that their own oral health should be a priority. Helping Kids Develop Good Oral Habits – Make it Fun! As you’re working to teach your child health dental habits, try making it fun to get them excited about oral care. Try some of these tips for making dental hygiene fun. Get Kids Involved in Choosing Their Equipment – Allow your kids to pick out their own toothbrush, toothpaste, mouthwash, and floss. It lets them take ownership of their dental health, and they’ll love the chance to pick out exactly what they want, whether it’s bubble gum flavored mouthwash or a toothbrush with their favorite cartoon character on it. Add Some Music – Sometimes it’s tough to make sure kids brush their teeth for the whole two minutes. 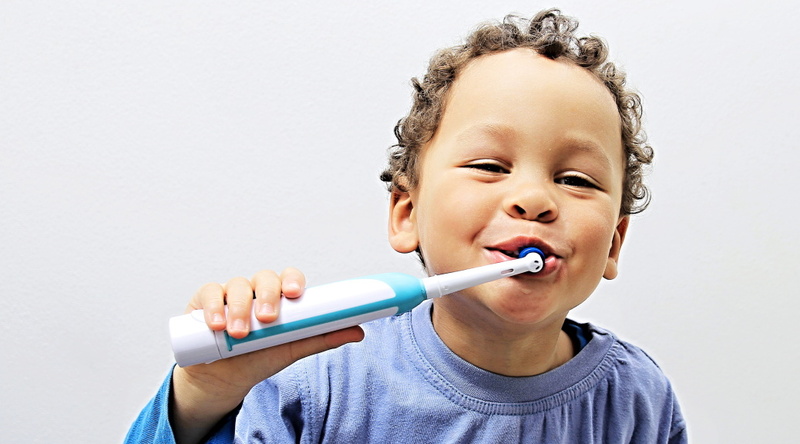 Add a tune to brushing time that lasts at least two minutes so they know how long they need to keep brushing. Dance while you brush to make it even more fun. Videos and Books – Watch exciting videos about dental hygiene with your kids or find a good children’s book that teaches kids the importance of good oral care habits. Come Up with a Reward System – If your kids need some motivation and encouragement to brush and floss regularly, consider setting up your own reward system. You can make a chart and let them earn stickers each time they brush and floss. Let them pick a fun reward for collecting so many stickers on their chart. Developing good oral health habits are important for kids, and it’s essential to start teaching healthy habits to your children as early as possible. By modeling an excellent oral health routine and making oral hygiene fun, you’ll help your children build good habits that last a lifetime.